Here’s the deal: I’m not a book critic (big news, huh?). Just the same, I go to the library every week and scour the children’s book section in search of inspiring story and illustration material. I’m rarely disappointed. Because I visit the library so often and always find something worthwhile, I thought It’d be fun to review a children’s book every week based on my finds. One caveat: unlike a “real” reviewer, I don’t plan to write about recently released books (unless I happen upon a great one). My hope is to highlight books that interest me, and that occassionally you’ll make time to discover or revisit one of my finds. This week’s pick, Ish (2004), comes from the pen of Peter H. Reynolds, who came on to the children’s book scene fairly recently. His 2003 book, The Dot, received widespread acclaim and garnered the Christopher Award. 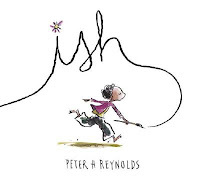 Ish, which could be considered a companion volume to The Dot, is Reynolds’ second book. This particular copy came with a CD of the book, narrated by Chester Gregory. Like The Dot, Ish’s illustrations use loosely-drawn ink lines accented with vibrant splashes of watercolor *. The unstudied appearance of the paintings conceals the fact that drawing loose is, in fact, harder than heck. (Yes, I can revert to using a sentence like that because this is a blog. HA!) Reynolds likely dedicates a lot of time to making his artwork appear improvised. Just like his predecessors-in-sketchiness, William Steig (Sylvester and the Magic Pebble) and Quentin Blake (every Roald Dahl book), Reynolds’ illustrations make each line “tell”*. Ish has a similar theme to The Dot. The book’s lesson that art is about more than being photographically accurate—it’s about having fun, making something meaningful, and expressing oneself in a unique way—will appeal to children and their encouraging art teachers. In short, I like Ish. It’s got incredibly energetic illustrations, sparse but perfect prose, and a message to which everyone—artist and non—can relate. Check it out. * yeah, that was an E.B. White reference there. * okay, technically he uses gouache, but he uses it like watercolor. I haven't read either The Dot or Ish...but I just put in a request for them at the library so they'll be waiting for me when I go in a couple days. :) Thanks!